1Department of Mechatronics Engineering, Istanbul Commerce University Küçükyalı, Istanbul, Turkey 34840. 2Department of Orthopaedic Surgery, University of Kansas School of Medicine – Wichita, Wichita, KS USA 67214. 3Departments of Mechanical Engineering, Wichita State University 1845 Fairmount, Wichita, KS USA 67260. 4Departments of Biological Sciences, Wichita State University 1845 Fairmount, Wichita, KS USA 67260. *To whom correspondence should be addressed. E-mail: shang-you.yang@wichita.edu. Received 23 February, 2017; Received in revised form 20 April, 2017; Accepted 04 May, 2017. Gentamicin, PCL, Electrospinning, Nanofibers, Antibacterial. Poly-ε-caprolactones (PCLs) incorporated with gentamicin of different concentrations (0, 2.5, 5 and 10 wt.%) were electrospun under various conditions, and the resultant nanofibers of different thicknesses (1, 2 and 4 layers) were used against the growth of Gram-negative and Gram-positive bacteria, such as Escherichia coli, Salmonella sp. and Staphylococcus epidermidis. PCL polymer was selected mainly because of its biodegradable aliphatic polyester characteristics and also, it plays a critical role in tissue engineering and pharmaceuticals. Scanning electron microscopy (SEM) images showed that the resultant fibers were in the range of 50 to 200 nm with an average diameter of 100 nm. 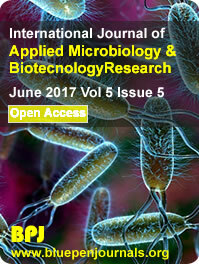 Bacterial test results revealed that the gentamicin molecules in the nanofibers were gradually released from the PCL nanofibers during the in vitro tests and prevented bacterial growth at different inhibition zones and kinetics. Overall, this work provides a detailed explanation of how to improve the antibacterial properties of new drug delivery systems for many biomedical fields, such as scaffolding; drug, DNA, and protein delivery; and wound healing.